When Netflix’s current Queer Eye reboot appeared on the streaming service in 2018, it was clear that it wasn’t following in the same steps as the early-aughts version. 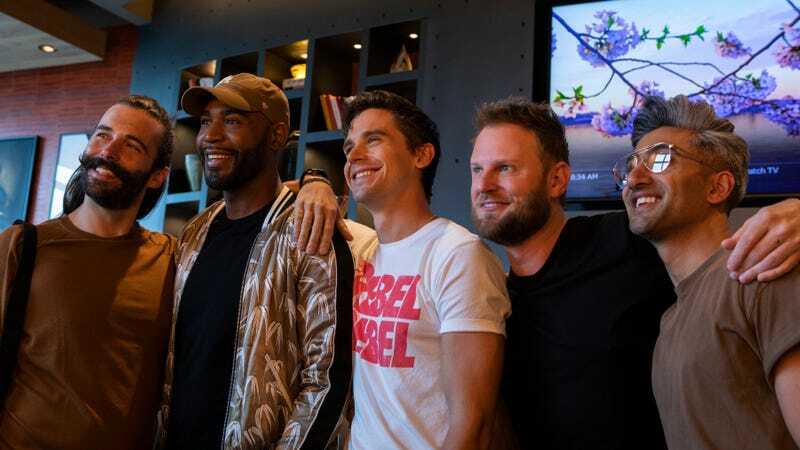 The Queer Eye squad and the stumbling subjects they makeover this time around are far more diverse in race, sexuality, and gender; in the third season alone, there are three episodes dedicated to making over women. In doing so, the show has pushed back on the stereotypical binaries of homosexual versus heterosexual men from which Queer Eye was born, i.e. the idea that straight men are slobbish creatures who don’t know how to dress themselves and gay men are happy to play makeover BFFs in real life and not just rom-coms. But the further and further away Queer Eye moves from its canonical straight male subject, the show misses something. It’s not that the reboot’s episodes featuring women, trans, or gay subjects aren’t great (an early episode featuring a coming out was especially touching, as was the most recent episode featuring the Jones sisters and their mini barbecue empire), it’s that in widening the scope of the Fab Five’s reign, the show implies that straight men who have lived their lives under the weight of heteronormative expectations are no longer relevant in terms of fixing, even though masculinity is still one hell of a drug in 2019. As Rich Juzwiak argued in his review of the show, the Queer Eye men push their heterosexual male subjects towards “normativity,” smoothing and sanding them down into cleaner and more socially successful versions of themselves, just as gay men have often done to make themselves more palatable to straight society. But the show is at its best when the Fab Five are pushing their male subjects towards something else: accountability. That is, the idea that straight men need to finally reckon with the fact that they have, up until this moment, been off the hook for what is traditionally feminine labor: cooking, cleaning themselves properly, making a home, etc. the Queer Eye makeover as it stands right now, especially in its most recent season, is steeped in the overwhelming, touchy-feely rhetoric of self-care. When the reboot first premiered, there was a greater attention paid to this discrepancy. It was made clear to a 36-year-old programmer with a home covered in dog hair that cleaning up was necessary for the people he brings over, and a father was taught to better organize his home and his children. In Season 2, the Fab Five had a savage field day with a sloppy young man who had lied to his parents about having finished college. But the Fab Five still largely handle their subjects with kid gloves and the Queer Eye makeover as it stands right now, especially in its most recent season, is steeped in the overwhelming, touchy-feely rhetoric of self-care. Men need to dress better because they don’t take care of their bodies. Even when they entertain, they are told to do it for the betterment of themselves. Queer Eye frames its standard makeover as a tool to help men internally, emotionally, but it’s impossible to ignore that the end results are also designed to appease others in the subject’s life because their wives, children, and friends are finally voicing that they expect better of them. These men don’t exist in a vacuum, yet the Five frequently treat their subjects, and their ineptitude, as existing in one. The Five seems to believe that simply a lack of self-care is the problem in each of the straight men they makeover, unique to each of them, and not an issue of a systemic lack of accountability in men when it comes to household or traditionally feminine labor. The show continually begs for one of the Five to say, out loud, that straight men don’t often know how to take care of themselves because they rely on the labor of others (even, in this case, the labor of five gay men.) The makeovers at the heart of the show could be a jumping off point for a conversation more substantial than about how feeling good is the end-all, be-all goal. For example, it’s fun to joke about “can’t cook” Antoni, but continually he frames food and cooking not as a necessary skill but merely a fun instrument of entertaining. “Food is love,” he says. A nice meal is “special.” Cooking is a great “gift” you can give. What it rarely is, even for the subjects on the show who do cook, is sustenance for a man and his family that he’s rarely expected to make. It’s telling that in order to get so many men on board with cooking that Antoni needs to wrap up the experience as a special occasion and not a new, daily occurrence. You could argue that diversifying Queer Eye’s subjects just makes for better TV; perhaps not everyone experiences joy at watching gruff country boy after gruff country boy made over into shorn hipster zaddies. But there’s also good TV in chiseling away at traditional expectations of masculinity, in which men are expected to be mere breadwinners who rely on mothers and wives for their food and laundry. In Season 3, straight men like a divorced camp counselor trying to make a home for his son and a father hoping to lose weight and cook healthier for his children are primed for sensitive introspection in ways that seem to make the Fab Five’s job easier. Even firefighters, cops, and backwoods hunters seem more than open to the group’s warm embrace, as if the show is designed to open us up to stereotyped Red State dwellers rather than the lessons the Fab Five has come to teach. Queer Eye might be so in love with mapping out a heart-pulling arc that it won’t throw the Fab Five a good challenge, because freeing men (as much as you can in a 45-minute television show) entombed in ideas of what a Real Man should be is worth exploring right now. Mainstream America is just getting hip to the idea that women’s work in the home (the cleaning, cooking, date-keeping, childcare, etc.) is often invisible, unpaid, and yet implicitly expected on basis of gender alone; an American time use survey released by the Bureau of Labor Statistics found that in 2017, on an average day, “19 percent of men did housework—such as cleaning or laundry—compared with 49 percent of women.” At the same time, there’s an ongoing conversation about how to raise boys and what we expect of them in the shadow of their innate privilege and entitlement. Queer Eye is, after all, a reality TV show. It’s understandable that it might want to inch away from its roots of the fumbling straight male, but there’s still more work to be done there.